Bug spray is like sunscreen to me…I don’t like the way it feels on my skin. Natural bug sprays can be effective, but they are not always enough when the mosquitoes are really out. What if there was a mosquito repellent pill you could take? What if it was homeopathic? It works on other bugs aside from mosquitoes like ticks and head lice. Product can be taken every 2-3 hours starting right before you go outside. Homeopathic medicine is by definition non-toxic. I have always responded well to homeopathy, and I can’t wait to try these mosquito repellent pills next time I go backpacking. I am fortunate to live in an area where mosquitoes are not prevalent at night due to an upriver wind, but I have been under attack ferociously on camping trips. 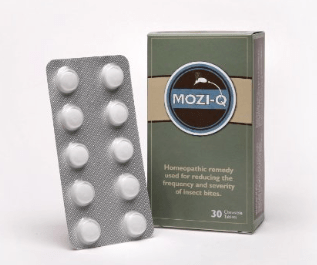 Mozi-Q is a homeopathic formula in the form of a chewable pill. These mosquito repellent pills are now part of my backpacking first aid kit.